Worrapolava: WIN! 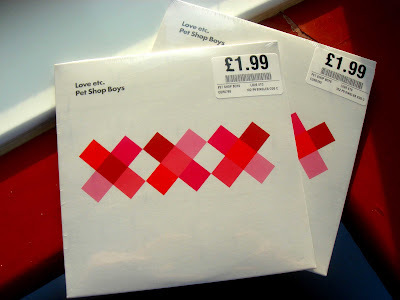 A CD single of Pet Shop Boys' Love etc. At the beginning of the week, these little beauties were like gold dust but thankfully, someone pulled their finger out and there are tons in the shops now. But if you still can't get hold of the CD version of Love etc. then fear not. I have two right here looking for a good home. And you can rest assured that you'll still be contributing to the PSB chart position tomorrow as I bought them today from HMV in Picadilly. Just answer this simple question to win. What is the b-side track, only available on the CD version, called? I'll draw the winners next Saturday. Good luck! Here's a review of Yes on the BBC's weekly Newsnight Review from last night with a preamble interview about the album. Music journos Tony Parsons, Miranda Sawyer and author Jonathan Freedland give their take the new output. Miranda likes four of the tracks and near wets herself over Did You See Me Coming?